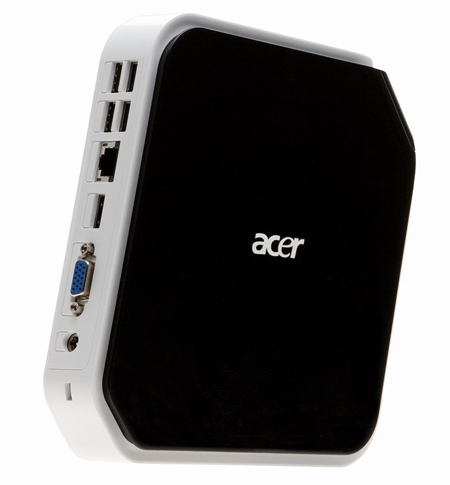 Acer's Nvidia Ion-based micro desktop PC, Revo, will go on sale in the UK on 5 May, with Ubuntu Linux among the available operating systems. Open source software fans shouldn't rush to the shops, though - Acer expects to tweak the Ubuntu machine's spec very shortly after release. The £149 nettop incorporates a 1.6GHz Intel Atom 230 processor backed by 1GB of DDR 2 memory and Nvidia's GeForce 9400M integrated graphics chipset - essentially the same one found in all the recent Apple MacBook releases - to give it the welly it needs - and other nettops lack - to play full HD content flawlessly. While the Linux machine comes with an 8GB SSD, two other versions, both running Windows Vista Home Premium, are equipped with 160GB 3Gb/s Sata hard drives. However, an Acer staffer told Register Hardware the 8GB SSD will be replaced with a 160GB HDD once the initial stock of 8GB machines has been sold. The HDD-fitted Linux boxes will also be priced at £149, he said. The Windows machines are priced at £249 and £299, respectively. Both come with 2GB of memory on two Dimms in a dual-channel configuration. The pricier model with bundle a WiiMote-style wireless games controller that can be changed from a baton shape to a pistol look with a twist of the two ends.